Are you looking for a grill that can cook 30 hamburgers at a time? Do you want one that’s just the right size for your family? Hundreds of charcoal grills are available on the market today and they vary in size, type, and available cooking space. 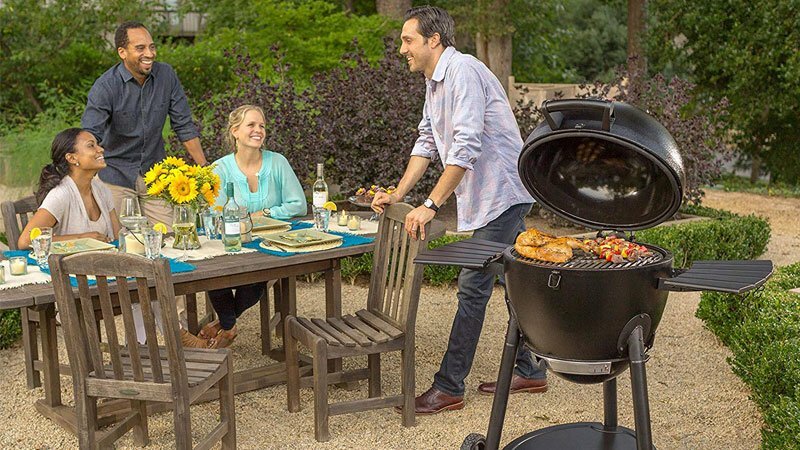 We’ve researched all the popular charcoal grills that are on the market today and have compiled a buying guide for you, so you can easily choose the best charcoal grill. 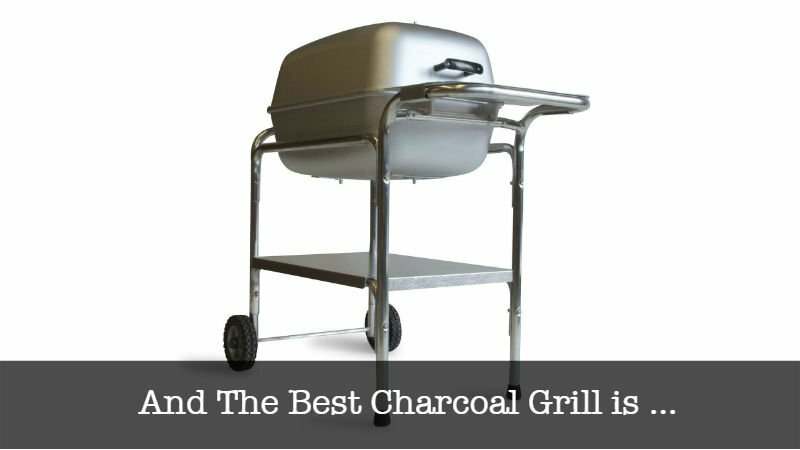 we have also compiled 10 best charcoal grill reviews, which will help you to find just the right one for you. Read on to find out our choices for the best charcoal grill. most people purchase charcoal grills because they want to cook outside, they like the nice smoky flavors that you just can’t get with gas grills, and they want enough room so that no one will be kept waiting for their supper very long. We’ll break down for you the dimensions and capacity of our ten contenders. Here’s the skinny on how our ten contenders operate. and what temperature timers and controls they offer to make sure your grilling is a success. This section will examine specifics of the cooking grates that make a charcoal grill’s reputation. What features does the grate have on one grill that another grate doesn’t? What controls and timers are offered that will make your grilling and chilling a success? If you’re like us, not only do you want a great high performing grill, but you also want to have the ease and satisfaction of owning a charcoal grill that is easy to clean. Your time is expensive, and you’d rather be relaxing with a nice cool drink in your hand instead of slaving over a messy cleanup. 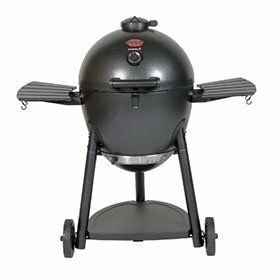 The Portable Kitchen PK 99740 Cast Aluminum Charcoal Grill and Smoker measures 35.5 x 20.5 x 35 inches and weighs 35 pounds. It’s made of thick cast-aluminum, and provides maximum heat radiation. It also features adjustable dampers and vents for exact temperature controls, aluminum bottom and side trays, and a hinged cooking grid that’s perfect for simple refueling. This charcoal grill was reproduced from a 1950s design and is sensational for grilling and smoking meats, seafood, vegetables, and poultry. This heavy-duty grill rolls smoothly across patios, decks, and lawns on quiet semi-pneumatic rubber wheels. The cooking section is completely detachable from its lightweight aluminum carriage, so it can be quickly disassembled when it’s time for that camping trip. Another plus is that the cooking chamber is built sturdy enough to last a lifetime! 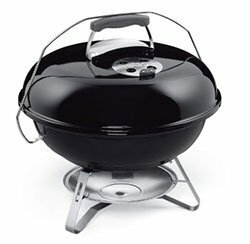 The Weber 15501001 Performer Deluxe Charcoal Grill, 22-Inch (Black) is approximately 43.5 x 48 x 30 inches, and has a generous cooking area composed of a 22″ enameled porcelain bowl and lid measuring 363 square inches. It has a state-of-the-art Touch-N-Go gas ignition system which lights up charcoal briquettes with a simple button push. Just imagine, no more smelly self-lighting briquettes or equally smelly lighter fluid! It usually takes 8-12 minutes to heat up the briquettes. This grill features a heavy duty two part Gourmet BBQ grate system. Clean up of the porcelain lid and bowl on the Weber Performer Deluxe Charcoal Grill is simplified by both a special One-Touch Cleaning system, along with a large capacity ash catcher. The grill on the Weber Performer Deluxe Charcoal Grill comes with a Char-Bin storage container. 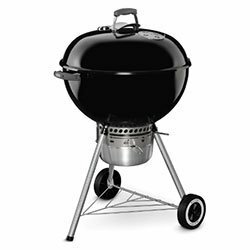 The Weber 14401001 Original Kettle Premium 22-Inch Charcoal Grill (Black) has an assembled dimension of 38.5 x 27 x 22.5 inches, and its cooking area of 363 square inches is roomy for its 22″ diameter porcelain-enameled lid and bowl. This grill is equipped with a plated steel-hinged cooking grate. Clean up is easy with the Original Kettle Premium Charcoal Grill. It provides a one-touch aluminized steel cleaning system that has a high-capacity, removable, aluminum ash catcher. It also has a lid thermometer which is built in to monitor the temperature of your grill. Storage is made easier by an integrated tool-hook located on the bowl handle. The lid handle also has a heat shield for your comfort, 2 nylon handles that are glass-reinforced with tool hooks and a rust-resistant aluminum damper. Finally, the legs are easy to assemble because of their spring clip/push pin system. With external dimensions of 28.16 x 50.51 x 60.22 inches, the Dyna-Glo DGN576SNC-D Dual Zone Premium Charcoal Grill provides an astounding 816 square inches of cooking area. That means that you’ve got the ability to cook 30 hamburgers at one time! It has a state-of-the-art Touch-N-Go gas ignition system which lights up charcoal briquettes with a simple button push. Just imagine, no more smelly self-lighting briquettes or equally smelly lighter fluid. This charcoal grill features four cast-iron heavy duty porcelain enameled cooking grates that superbly retain heat for searing foods and lock in all the natural juices. Depending on the type of foods that you’re cooking, you’ll be able to make a dual-zone grilling area using a removable steel-firebox divider. The charcoal trays can be adjusted separately, as well as the temperatures, by using the dual-tray adjustments cranks. So, this means that you can cook that chicken and steaks side-by-side at different temperatures! The Weber 121101 Jumbo Joe 18 inch Portable Grill has respectable dimensions of 19.75 x 20.5 x 19.75 inches. It features large centered bottom vents and heats evenly across the grate (which is 18.5 inches in diameter) plus it has a rust-resistant ash catcher, aluminum dampers, and one glass-reinforced nylon handle. It has a locking lid, as well as a locking carrying handle, which comes in handy when you’re transporting it somewhere in your car. The assembly time for this particular grill is around 15 minutes. This 18-inch powerhouse has a solid feel, no leg sway, and its vents are easily adjusted for whatever tension is required. The Jumbo Joe can fit a surprising amount of food on its grill and is perfect for those days that you aren’t up to pulling out the larger grill. It goes without saying that this grill is a very good choice for tailgating parties. Clean-up on the Weber 121101 Jumbo Joe 18 inch Portable Charcoal Grill is a breeze! 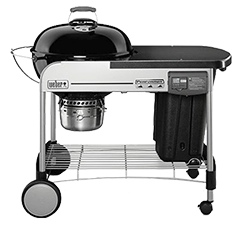 The Weber 741001 Original Kettle 22-inch Charcoal Grill measures 22 x 25 x 38 1/2 inches high, and the grill has approximately 363 square inches of grilling space. This grill is easy to assemble, and the porcelain-enamel coated lid and bowl are the perfect size to permit heat to circulate for even grilling. It takes approximately 1500 degrees Fahrenheit to bake on this porcelain enamel, which guarantees that this grill will be burn and rustproof, and will last for many outings. A simple adjustment of the damper furnishes temperatures that are low enough for smoking food for hours, and high enough for you to sear those steaks. The plated steel cooking grates are strong and a breeze to clean. Cleaning is simple the One-Touch way – just rotate the handle, so that the 3 bowl blades transfer ash directly into the ash catcher, which lifts out for simple cleaning and ash disposal. The Char-Griller 2828 Pro Deluxe Charcoal Grill measures 50 x 29 x 42 inches, and has a primary cooking space of 580 square feet. Add to that 270 square inches of warming rack for a grand total of 850 square inches. This grill features 4 lift-able sections of cast-iron cooking grates, adjustable charcoal grates, and an easy-dump ash pan. In addition, this charcoal grill has a heat gauge, large wire bottom shelf, and wooden side shelf, featuring a condiment basket and utensil hooks. You will experience total heat control with a heat gauge and a fully adjustable fire grate in the hood. Cleaning is made easier if you pre-treat your grill both outside and inside with cooking spray. Another cleaning trick is to line the sides and base with heavy duty aluminum foil. 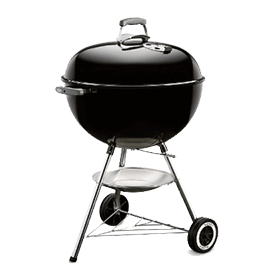 A duo model of this charcoal grill is available that uses charcoal on one side and propane on the other. 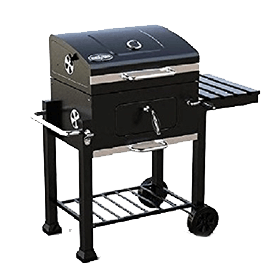 The Kingsford 24″ Charcoal Grill (Grill Only) measures 26.37 x 42.32 x 44.88 inches, and provides a primary cooking area of 360 square inches and a secondary cooking area of 205 square inches. It has a cast-iron cooking grate, a black paint-finished high-temperature steel lid, 2 easy rolling wheels, and a foldable side-shelf table that has tool hooks. Cleaning is simplified if you coat the grates before using them in Crisco before baking them in an oven for several hours. It has a warming rack which folds with the lid when opened. This grill is a snap to assemble, and the internal temperature is easily controlled. You will appreciate the option of raising and lowering the charcoal by means of a crank handle. The Char-Griller 16620 Akorn Kamado Kooker Charcoal Barbecue Grill and Smoker (Black) measures 21.6 x 28.7 x 24.8 inches and has a primary cooking space of 314 square inches and a warming rack of 133 square inches, totaling 447 square inches. Its body is made of triple walled 22-gauge steel, and its cooking surface is cast-iron. It has an interior finish of porcelain coated steel and an exterior finish of powder coated steel. This charcoal Kamado grill will maintain cooking temperatures of 200 to 700 degrees Fahrenheit. 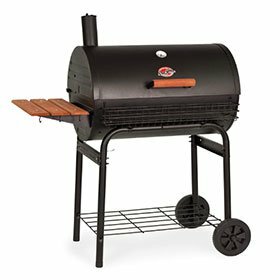 It has fuel efficient bottom and top adjustable dampers that keep air flowing evenly in and out of the grill for smoking or cooking. It’s very easy to assemble and is a delight to clean. Just unlatch the catches and slide the whole bottom (lower vent and ash hopper) and dump. The Weber 121020 Go-Anywhere Charcoal Grill measures 14.5 x 21 x 12.25 inches and provides a grilling surface area of 160 square inches. It has plated steel legs which secure the lid in preparation for transport and a plated steel rectangular cooking grate. 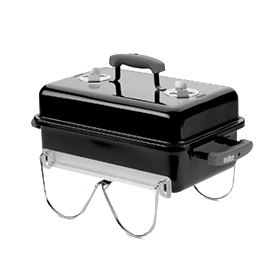 There are two adjustable dampers with three vent holes each which regulate air flow, and a porcelain enameled bowl and lid with a nylon glass-reinforced handle which stays cool while the grill is cooking. 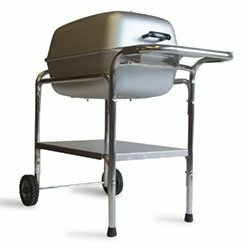 This is a very compact grill that has a very generous grilling space, and is ideal for tailgate parties and camping (four medium steaks or six to eight chicken pieces fit comfortably on it). This grate, constructed of triple nickel-coated steel is very easy to clean – just place one end into a plastic bag and then simply pour out the ashes. Another plus is that it cools down remarkably fast. 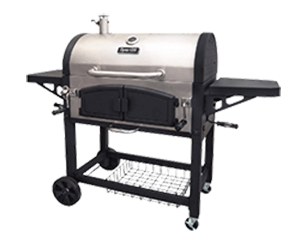 After reading literally hundreds of charcoal grill reviews, and carefully comparing all the features of these competitors, we have selected the Portable Kitchen PK 99740 Cast Aluminum Grill and Smoker. We are very impressed both with the retro look and the sleek aluminum design of this grill. The construction of the charcoal grates are extremely sturdy, and it beats out all of the more modern looking grills. This charcoal grill is a marvel of engineering. Good cooks always say the proof is in the pudding, and that certainly holds true for this marvelous grill. Many reviews mentioned that the chicken that they grilled on this machine was praised by all guests as the best chicken they’ve ever eaten. People also mentioned that the instruction manual and cookbook that came along with this grill were very helpful and detailed, and that the Portable Kitchen PK 99740 Cast Aluminum Grill was worth every cent of its slightly higher price. This grill has also received rave reviews from Bon Appetit magazine and many other cooking magazines as well. We hope that you have enjoyed our buying guide, and we hope that our 10 best charcoal grill reviews will be useful in choosing the very best charcoal grill. We would appreciate it if you would share any thoughts you might have on this review, and share our article on social media as well.